World Energy plans to invest $350 million to complete conversion of its partially converted petroleum refinery in Paramount, California, acquired from Delek US Holdings in March, and expand biofuel production on-site from 40 MMgy to 306 MMgy. Calif.-based biodiesel maker Crimson Renewable Energy has acquired Ore.-based producer and UCO collector SeQuential. Crimson gains feedstock supply options for its Bakersfield plant and expands its ability to supply biodiesel to West Coast customers. Crude oil prices recently reached a four-year high, helping drive up biodiesel fuel prices and improve biodiesel manufacturing margins. Information from Agrarmarkt Informations-Gesellschaft mbH shows biodiesel prices are up 22 percent since spring. Imerys personnel have spent much of 2018 talking about new and diverse feedstocks for biodiesel production, and how to help biodiesel manufacturers incorporate them into their existing processes. Here is an overview of that discussion. 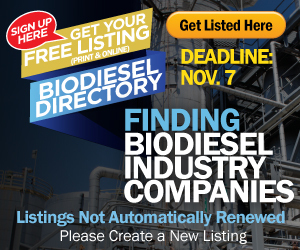 Biodiesel Magazine spotlights a producer whose recent acquisition fulfills increased feedstock demand, a consulting firm that assists in market entry and production efficiencies, and the expansion of one of today's fastest-growing biodiesel refiners. While oil refiners adding a small percentage of renewable feedstock to their operations sounds simple, the political, economic, technical, societal and market consequences are anything but. Woolley Fuel celebrates its 10th year as a distribution location providing high-quality biodiesel to consumers across New Jersey. Founded in 1924, Woolley Fuel became the first company in New Jersey to offer biodiesel to the public 10 years ago. Emerging Fuels Technology Inc. has executed a license agreement with Red Rock Biofuels LLC under which EFT will provide its TL8a Fischer-Tropsch technology to provide additional FT capacity for Red Rock Biofuels' biorefinery in Lakeview, Oregon. Crown Iron Works has broken ground on its new global headquarters to support the 140-year-old company's commitment to growth and innovation. The new center will serve as a resource to leading global manufacturers in the oilseed processing industry. The Trump administration has released estimated timelines for the development of three U.S. EPA rulemakings that pertain to the Renewable Fuel Standard and year-round E15 sales, including one that includes a reset of statutory blending targets.